Out on the water, your fancy 65-piece marine toolset in its bright yellow plastic carrying case probably WILL sink if you drop it over the side, and it probably WON'T save your hide as many times as Rescue Tape will. Rescue Tape is small enough to justify keeping a couple of rolls on the boat (and one in the truck). It's actually a self-fusing silicone tape so there is no adhesive to wear away; it seals air- and water-tight. At 700 psi, it should keep any hose leaks at bay until you can get assistance. With the ability to resist 8,000 Volts and 500° F (260° C), temporary electrical cord repairs are not a problem. For more information, or to buy a couple of rolls, visit RescueTape.com. They say that the difference between sailors and powerboaters is that powerboats are often intimidated by windy weather and waves, while sailboats thrive in blustery weather. The White Star of London. It just sounds elegant, doesn't it? Or perhaps you were thinking of her sister ship, The Elegant Star of London. They are both very elegant, actually, and both (or either) can be yours for a day, a week or even longer. These beautiful 76- and 80-foot yachts are available for charter in the Balearics and Mediterranean waters. They were recently brought to my attention as charter options for watching the America's Cup races next summer - What a cool idea. Sign up before all the best dates are taken: click here. India has the 2nd largest population in the world - over a billion citizens, which is second only to China. With all those people - and a 7,000 km coastline - there surely must be a plethora of boaters in India. That's why I wouldn't be surprised if the India International Boat Show (IIBS) grows to become the largest boat show in the world. I'm not sure it is, but the show's website claims that the "IIBS brings together the entire boating, marine and aqua tourism industry from South Asia and the Middle East." So, if you're in South Asia this weekend, be sure to pop in on the IIBS. If Jimmy Buffett has a new song, it's suitable for DailyBoater's weekly sea songs feature, even if the song isn't about boats. That's because Jimmy has earned the right to put whatever song he wants to on my site. 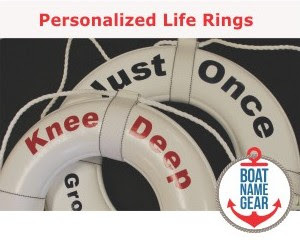 I have listened to more songs by Jimmy Buffett while boating than any other artist, so in my mind EVERY song Jimmy does is a boating song even if it's not exactly about boats. Bama Breeze is like that. Take a look and listen to Jimmy's new single on video at Margaritaville.com - here. Buy the new album at Amazon - here. If you like your boat shows old and large, then you will LOVE the 35th Annual United States Powerboat Show. It says right on the show's official website that they are "The Nation’s oldest & largest in-water Powerboat Show", so will certainly get your old and large fix at this event. 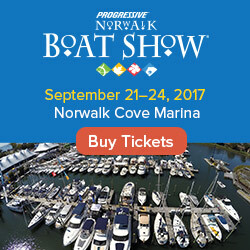 Seriously, if you are on the east coast this weekend, you must attend this great event, which includes a fleet of boats ranging from luxurious motoryachts and performance boats to offshore fishing machines, family cruisers, center consoles, and even a variety of unique and affordable inflatables. What: 35th Annual United States Powerboat Show. Did you know that the winner of the 31st America's Cup in 2003 was a team based in Switzerland? The team name is written on the side of the boat, but the actual winning boat's name was SU164. Team Alinghi is launching a new boat for the 32nd America's Cup, which is happening next summer (2007) in Valencia, located on Spain’s Mediterranean coastline. Learn more about Alinghi -- the team and the boats, past and present, here. More details about the 32nd America's Cup can be found here. South Florida's 52nd annual Columbus Day regatta took an ugly turn Sunday when two boats collided on Biscayne Bay, resulting in the death of one young woman, and serious injuries to seven other people. As of this posting, one man is still missing. The Miami Herald is reporting that a boat which was being towed was hit "violently" by another boat which did not stop - an on-the-water version of a hit-and-run. Read further details from the Miami Herald here, and the Associated Press here. Whether you live on the Pacific or the Atlantic coast of the United States, you're not only near a boat show this weekend, but you are near a "37th Annual" Boat Show! On the left coast, you've got The 37th Annual International Sail & Power Boat Show, being held at the Long Beach Convention Center and Shoreline Village Marina in none other than Long Beach, California. Live on the Atlantic? Then you'll enjoy the 37th Annual United States Sailboat Show - billed as "The Nation's oldest & largest in-water Sailboat Show" - at Annapolis City Dock and Harbor in, of course, Annapolis, Maryland. Both shows run from Oct 5th (today) through the 8th (Sunday), except for the Annapolis show which runs all the way through Monday. If this link does not bring you to the Annapolis show website, just type in usboat.com and remember that it's their fault not mine. This link here is a one-way ticket to Long Beach. Enjoy! It took six helicopters, a Navy search plane and two rescue boats - but 24 hours after a 17' boat capsized 15 miles offshore in the Atlantic, the last of the 5 boaters has been rescued. Coast Guard Petty Officer Donnie Brzuska is quoted in several newspaper articles as stating that the five men were fishing in a 17-foot pleasure boat about 15 miles offshore when it began taking on water and capsized about 11 a.m. Saturday. You can read about the rescue here, but make sure you also check out the message boards here... While it is fortunate these five men were smart enough to have PFDs, there are some interesting comments concerning why these guys were SOOO far offshore in such a small boat with so many people. I hope we hear the survivors' tales soon.